Want tosave 3,00 kn on this order and become Loyalty program member? Truffles have become a job, love and lifestyle of Anita and Kvinta Zigante family and family Tel. Natura truffles are proud of their own family production thanks to whose magic of art offers a wide variety of truffle products. It is important to point out that each product is loaded with only the finest raw materials that are carefully selected and are the fruit of the great effort, love and responsibility of each member of the family business. 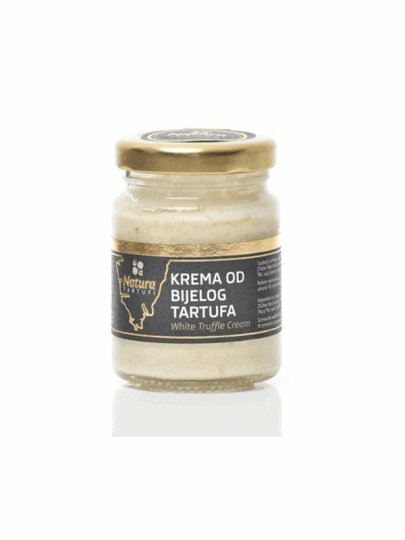 A delicious delicacies, a divine taste of white truffle, Grana Padano parmesan cheese and cream that enriches each sauce or is simply used as a warm bread salad. cream, wheat cheese, white truffles (Tuber borchii 3%), white truffles (Tuber magnatum pico1%), salt, wheat flour type "0".